What a looker, these Ford cars were the must-have of the 50’s. They still look great. I am hoping for a few chopper shots along the way! I have the youngest navigator out of all the starters and Jackson (aged 18) is in for the treat of a lifetime. For the past week Jackson and I have worked long hours on the car was at last taking shape. After a roadtest we decided we do need to upgrade the brakes further. We have plenty of go but need more stop! The new twin bag power assist brake system was shipped from the USA and promptly fitted and we have now attached some of the decals today but there are more to come including door numbers. By Friday the car was ready for a final 1000k workout. The new fuel tank is fitted and during the next drive we will calculate consumption in relation to the fuel gauge reading to be sure we don’t run out of gas at inopportune times. It was difficult to make the decision to either have air conditioning or power steering. I went for power steering and I am not sure I got it right. Over the past week it has been around 30-34c (86-93F) and the car ran cool engine wise thanks to the Davies Craig electric radiator fans but it was a sauna inside! Motacarb – Craig from Motacarb supplied and tuned the Holley 4 barrel and did the dyno testing – great tuning, goes well. Davis Craig P/L Melbourne – John Benson sent me the works to convert the 1953 to electric water pump and cooling fan. Wonderful products. MD Electrical -Matt Dawson did the electricals, a complete rewire front to back and helped with the mechanicals. Arundel Cylinder Heads – Troy Dunstan worked ever so hard hand making engine bolt on parts and rebuilding the original tired engine. Cheapa Auto Oxenford – As always my favourite parts store. Trevor Duncan and staff went out of their way to locate whatever I needed. Thanks guys. 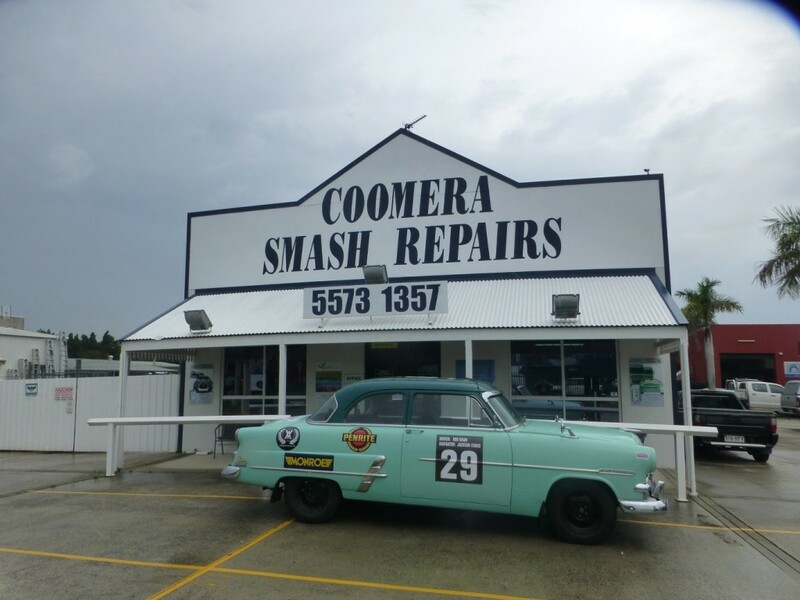 Gold Coast Brakes – Neil worked hard to convert the standard single line brake system to dual line vacuum assist – the 1953 really stops now. KHA– I have unfinished business with KHA. I need to grow the Rod Wade Every Day Hero donation from the $61k that is there at the moment by at least another $60k so KHA can order their first Kidney Kamper. The prototype was built with Vintage Adventurer P/L private funds last June (2014) we now need to raise enough money for KHA to place an order for these wonderful ‘freedom machines’. PLEASE HELP US. There were many more that did their bit and helped out wherever they could. Big thanks to all that helped prep this car for what we hope is an adventure of a lifetime…without drama! The build of this car has been intense and one of the most difficult for me thus far. There were so many pieces that had to be handmade. Many people assisted and we have made it. Today is Saturday and the car has to ship out for Singapore on Monday. All except one decal are on, the fridge/freezer is in between the front seats.